If you find Siri too sassy or Cortana too limited, Facebook is now offering an upgraded knowledge-navigator experience. Wired reports the social network has begun rolling out a new virtual assistant called M (for “Messenger,” probably, or as an homage to everyone’s favorite MI6 boss). A few hundred users in the Bay Area will test-drive the free service today via Facebook’s Messenger app, which combines the fathomless knowledge of the internet with the discerning tastes of human beings. 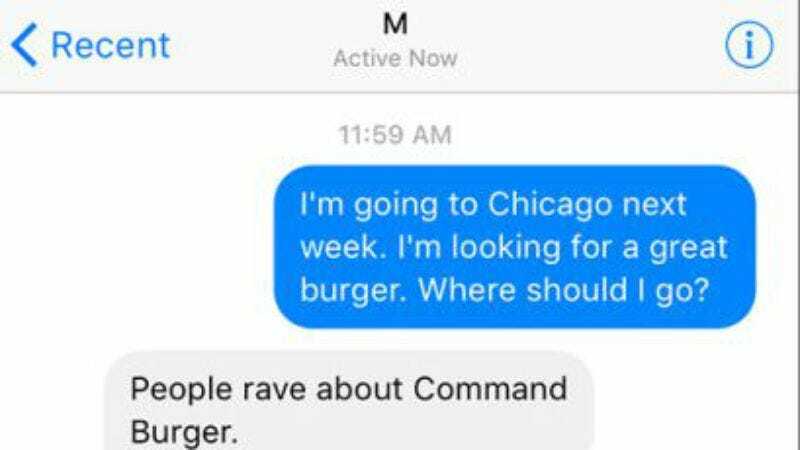 Facebook will employ these M trainers to “make sure every request is answered,” so you’ll be able to complete your midnight self-diagnosis or fulfill your midnight hankering for a sub. It all starts with opening the Messenger app and sending M a note with your query or request. M will ask pertinent questions and provide updates on the task’s progress. Unlike Siri and Cortana, M won’t speak in a “gendered” voice (whatever that may be) and, once the task or query is complete, you won’t know if it was M or an M trainer (or a combination of) who helped you. Facebook employees have been testing the service for weeks now, and one of the most impressive examples of M at work involves dealing with utility or cable companies to install, move, etc., your services. That’s mostly thanks to M trainers, who all have customer service backgrounds and can make a slightly more nuanced decision than “dial or hang up.” So the tech side of M can get you a 3 a.m. ride to the airport, but the human element might schedule a pit stop for coffee. Eventually, though, M will learn enough of these human behaviors to respond entirely its own. In a separate article, Wired writer Cade Metz reports on the way M will feed the data it acquires from being your personal assistant (and maybe best friend) into Facebook’s artificial intelligence. The goal is to shift the burden of the work to M, but the M trainers won’t be completely removed from the equation. There are, of course, business applications for the virtual assistant. Facebook is already promoting M’s customer service capabilities, but wouldn’t confirm which companies, if any, are clients. But Facebook is already envisioning a time when a customer service call will essentially be handled by M on both ends. Given the current mind-reading state of Facebook’s advertising, you might be wondering if M will also sweep through your page and status Likes to suggest the perfect underwear brand. But Marcus told Wired that the service will make its recommendations solely based on the information you provide to its follow-up questions. That may change in the future, but with prior consent from the user.